During initialization the controller passes its update function to the Filter DOM to be called whenever a box in the filter changes state, the Filter DOM sets this function to the click events of the check boxes. So when anything changes in the filter display this update function in the controller asks the Filter DOM class for its active filters ➊. The Filter DOM class responds to this call by using jQuery to find the appropriate HTML elements ➋, filtering out those boxes that are checked, and responding to the controller with a simple data structure that indicates which boxes in each group are checked ➌. The controller uses this information about the filter state to decide which games should now be visible, divides them into the left and right columns, and calls the Entry List DOM with the details of which element ids should be displayed in the list ➍. 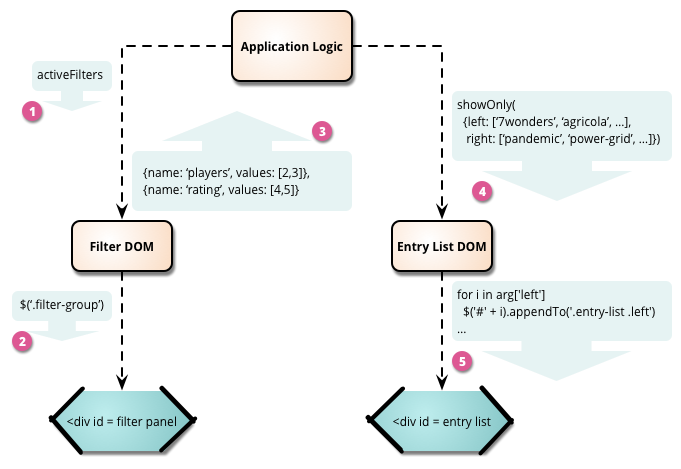 The Entry List DOM uses jQuery to shuffle the HTML items into the right divs to do the job ➎. The principal benefit of doing this is to make it easier to reason about each class by keeping it focused on a single task. When I'm working on the Filter DOM class, I concentrate on how to do the DOM manipulations on the HTML elements. When I work on the controller I can ignore the details of the HTML structure, css class names, and the like. A good modular design tends to correlate to testability. Each class can be tested in relative isolation. A particular advantage with a Segregated DOM is that I can test the controller without using a browser or mock browser such as PhantomJS. Since I don't need a DOM to test the controller, I can test it in node and just supply some simple test doubles for the DOM gateways. This makes it quicker and easier to modify the controller. By shifting as much logic out of the DOM gateway as possible, I can increase how much testing I can do without resorting to PhantomJS and the like (an application of the Humble Object pattern). Pete Hodgson was a valuable source for ideas for this article. Coincidentally, his own article on using Segregated DOM was published the same day. It has more details and a short example. Pete Hodgson gave me some useful ideas for improving this article. 1: You can use a similar separation for server access - this is the classic application of Gateway.